The election coming in just over a week will be decided by the people who vote. It’s an obvious statement, but it carries profound importance, because in American presidential elections, about 40 percent of the population doesn’t actually show up. The United States trails other rich countries, many of which have turnout rates that reach into the 80-percent or 90-percent range. There are many reasons for this: One party sees voter suppression as its means to political power; the Electoral College makes many states “safe” enough that voters see no reason to turn out; many states disenfranchise anyone convicted of a crime. But our onerous voter registration system is one of the most important contributors. Roughly 55 million Americans, or one-quarter of the voting-age population, simply aren’t registered and therefore couldn’t show up on election day even if they wanted to. What would happen if they did? To explore the unregistered population, I used the Cooperative Congressional Election Studies database and combined the 2012 and 2014 surveys to get a larger sample. Political scientists Jesse Rhodes and Brian Schaffner advised me on using the dataset. Because my aim was to explore the demographics of who is unregistered and how they differ from those who are registered, the CCES data source is preferable to other datasets like the Census Bureau. The Census Bureau relies on self-reporting, whereas CCES validates its dataset by matching it to Catalist, a data vendor that works with progressives. Of the 82,306 respondents matched into Catalist, 88 percent were actively registered and the rest were dropped, inactive, or unregistered (my analysis uses the standard survey weights). This is below the actual unregistered rate, since the unmatched people are less likely to be registered (though lack of registration is not the only reason an individual might not match to Catalist) and unregistered people are less likely to respond to the survey. For my analysis, I also added all those who couldn’t be matched to Catalist, but reported being unregistered. (People are unlikely to be registered but unaware of it.) This leaves me with a sample of more than 16,000 unregistered individuals and nearly 73,000 registered individuals. To begin, I examined demographic differences in registration. Among those 55 and older, 13 percent are unregistered, compared with 35 percent of those under the age of 35. I also examined race and class divides. While 19 percent of whites were unregistered, 24 percent of African-Americans were, 40 percent of Latinos and a whopping half of all Asian-Americans. To put that in perspective, if every registered Asian-American voted, their turnout would still be lower than white and black turnout. There are class divides as well: Nearly a third (30 percent) of those earning under $40,000 were unregistered, compared with 12 percent of those earning $150,000 or more. Among young people of color earning less than $40,000 a year, 52 percent are unregistered. 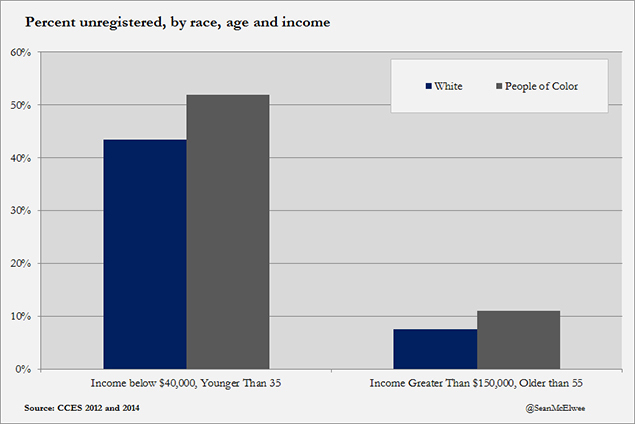 Among white people 55 or older earning more than $150,000 a year, 8 percent are unregistered. Clearly, these registration barriers contribute to the voting disparities I’ve documented elsewhere. These voting disparities produce disparate political outcomes, because the registered have different preferences than the unregistered. What do the unregistered want? To explore the attitudes of the unregistered I used both the 2012 and 2014 CCES and data from the Economist/YouGov tracking polls. First, unregistered Americans are as likely as registered Americans to support Democrats, but dramatically less likely to support the Republican Party. 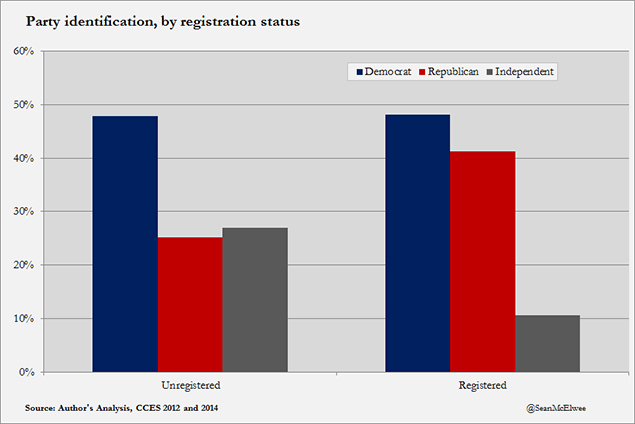 Unregistered Americans are more likely to identify as Independent than registered Americans. I also examined a question that asks respondents how they would prefer to reduce the deficit: defense spending cuts, domestic spending cuts or tax increases. 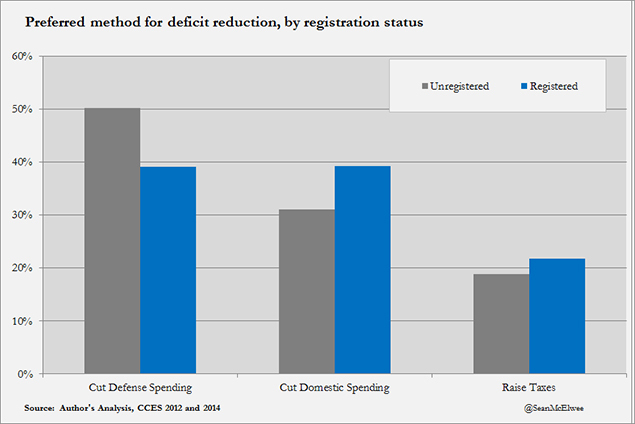 Unregistered Americans were more supportive of defense spending cuts and more opposed to domestic cuts. They were also less supportive of increasing taxes. Using the Economist/YouGov poll, I examined net support (the percent in support minus the percent opposed) for four proposals that have been discussed frequently in the 2016 election cycle: a $15 minimum wage, single-payer healthcare, free college tuition and a border fence. 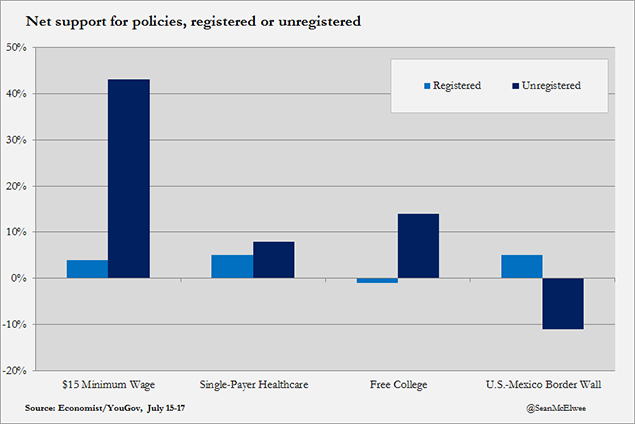 As the chart below shows, unregistered Americans were more supportive of the progressive options. Interestingly, unregistered Americans were less likely to endorse cynical views, such as believing that special interests get what they want due to political contributions and that “a lot” of government money is wasted. This suggests that being unregistered is less an explicit condemnation of the political system and more often due to other factors, such as a recent move, relative youthfulness or lack of political interest. These gaps matter, because research suggests that the preferences of voters are better represented by policymakers than the preferences of nonvoters. The easiest solution to our registration problem is a system of automatic voter registration, in which eligible voters are automatically registered to vote when they interact with the DMV, social services or other government agencies. Young people getting their driver licenses could be “pre-registered” and automatically added to the voter rolls when they are eligible to vote. This system, in which the government compiles voter rolls, is the norm in other countries, and was actually how voter registration was originally implemented. We know that requiring voter registration depresses turnout, and we also know that policies that extend registration deadlines or allow voters to registered on the day they show up to vote are the most effective way to increase turnout and reduce inequities in voting. The result would be a step toward a more perfect democracy, one that represents all Americans.